Samsung DV209AEW Electric Dryer 7.3 cu. ft. 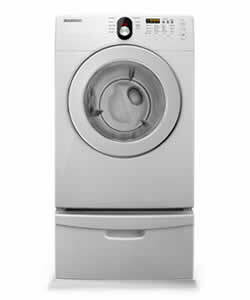 The DV209AEW is a dryer manufactured by Samsung filled with all the features the brand is known for. With what the manufacturer claims as the largest front-loader in the market today, you can save a lot of time and money by accommodating batches of loads in one go. Your drying time is also cut in half with the model’s Sensor Drying technology. This model is also equipped with Drum Light, so you can load and unload laundry items easily, without leaving anything in the dark. Lastly, there are three drying levels for you to customize dry any item – no damaged items here. With the Sensor Drying feature, this model has an internal smart sensor that detects the levels of moisture in the laundry. The machine then adjusts the drying time according to the detected moisture level, saving you time and energy. It’s a common occurrence that a lot of dryer users leave a small item or two in the dryer because they thought they’ve gotten them all when unloading or they didn’t see that they have left something because of the dryer’s dark interior. With the Drum Light, the dryer is illuminated inside, so you can see everything, whether you’re loading or unloading items. The 3 drying levels that the dryer’s machine is equipped with: more dry, normal dry, and less dry, makes sure that there are drying conditions to fit your every need. The controls on this model are top notch and easily accessible, as they are located at the top portion of the front face of the dryer. The center soft touch dial is ergonomic and therefore easy to handle. The Red Graphic Dot LED Display allows the user to be informed of what’s going on in the machine. The white exterior looks refreshing and easily blends with the look of any room it will be placed in. The model’s reversible door makes it easy for any user to operate the machine, without the need to exert too much effort in opening and closing it. Dubbed as having the largest front-load washer in its class, the DV209AEW easily accommodates up to 31 bath towels. Because of this, fewer loads will be done and you will save time, energy and money because of lower utility bills. Both the Manual and Sensor drying features have specific cycles that cater to types of laundry and specific requirements users demand. Manual Dry has Air Fluff and Time Dry cycles while Sensor Dry has Delicates, Heavy Duty, Normal and Perm Press. The basic drying cycles are fine, but a number of unique fabrics may not be cared of properly because of the limited number of cycles. This model does not have a sanitary cycle which should make sure that germs and bacteria are removed from items that cannot be washed like pillows or stuffed toys.